Powermatic dovetailing machines are designed to cut dovetails quickly and accurately with ease. The joints these machines create are precise and will fit together tightly and perfectly every time. 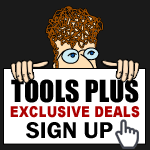 Tools-Plus offers both manual and single end dovetailing machines depending on your needs and all their dovetail machines are covered by their iron clad 5 year warranty. Cutter height of 3/16" to 3/4"